In the past, the European Union has engaged in several processes to discuss its policies and decisions with the European people, but without much success. The EU is still blamed for its lack of popular foundation and its democratic deficit in the European Council and the European Commission that by many has been perceived to neglect people’s needs and concerns. Europe’s People’s Forum turns the upside down of these processes by letting the people formulate its visions and policy proposals across the 28 member states and by presenting and advocating for these proposals towards European and national politicians and civil servants. It is the ambition that the forum will constitute Europe’s people’s counterpart to the World Economic Forum in Davos. The aim of Europe’s People’s Forum is to strengthen European democracy and engage the people and media in Europe in a debate of strategies and visions for the future of the EU together with other national European initiatives. This debate seeks to impact on the courseof the EU and to better align future EU political strategies with the populations’ priorities. 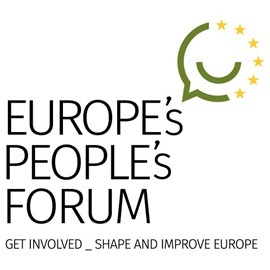 The forum is implemented by the international non-profit organization Europe’s People’s Forum (EPF), registered in Denmark, in collaboration with tentatively more than 50 active organisations from the 28 EU member states who will convene in 2017 to determine the activities for the three following years. An easily accessible and active debate platform on the Internet is crucial to promote the debate across member states and ensure maximum involvement of Europe’s people. The project will also engage with the European organisations for regional and national public service media as key actors to increase participation in the project. The Research Validation Panel consists of recognised researchers and research institutions across Europe and covers the broad range of thematic challenges that will be dealt with by EPF. The Research Validation Panel will ensure that the final policy proposals that the people put forward are not only easy opinions but also are well substantiated in a broader analytical and political perspective. It is however important that the visions remain those deriving from the popular debates in the 28 countries and only are validated, adjusted and substantiated through the Research Validation Panel. Europe’s People’s Forum is registered as an international nonprofit organization in Denmark with a professional board comprised of Danish and European members who are legally responsible for the activities of the organization. The organization will also have an advisory committee with representative from the 28 member states. Most activities are expected to take place across all other European countries in which Europe’s People’s Forum expects to have one or two national partners as connected by an online platform. The organisation actively raises funds from private foundations and companies but might in a later phase also receive funding through the EU Institutions in Bruxelles.